The 2nd Annual VW Sunshine Coast Campout was a blast! A huge, enormous thank you to everyone who came out to the 2nd Annual VW Sunshine Coast Campout! We had a blast and we hope you did, too. About thirty vans joined us for the Sept 13-15 campout at Katherine Lake, forty minutes north of Sechelt, BC. It was so great to see old friends and make new ones, too. Westfalia folk are the coolest people out there! As always, we spent most of the weekend walking around and checking out each other's vans. There were some sweet vehicles there (there always are!). It's amazing to see how each van really does have its own personality--a hallmark of all the love and attention its owners have poured into it over the years. Some of us also took the opportunity to do some repair work and tuning up. We had a good number of families join us, which was great. It's so wonderful to see kids spending their childhood enjoying awesome Westy adventures. 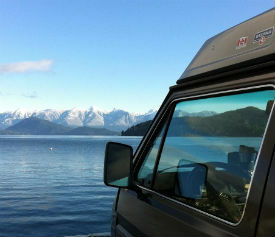 Often their parents grew up doing exactly the same thing--which is why they have a Westy now. We had several four-footed friends with us as well. The weather cooperated nicely. We had fog on Saturday morning but it burned off to give us a gorgeous sunny afternoon. Most of the kids and a good number of adults took advantage of the heat to get some swimming in. The water was fabulous and the campsite was absolutely beautiful. Sorry there are no pictures of people swimming at the beach. We were too busy swimming ourselves to take any! It was interesting to see all the different types of awnings and tents people were using to extend their living space. We actually used the campout as an opportunity to check out a new product we're now offering in the shop -- the Add-A-Room shelter! Those babies provide a 9.5' x 10.5' fully enclosed room and stretch out to provide an additional 15 square feet of space when the front and side walls are set up as awnings. You can learn more about them here. We enjoyed a fabulous potluck dinner on Saturday night. There was delicious leek soup, salmon, sausages and sauerkraut, chili, chicken wings, 7 bean dip, amazing cheeses and salami, and many other dishes -- plus an incredible selection of dessert. Westy owners are amazing cooks! There was also a cribbage tournament for the card players in the group. The winner, Lyle, received a great cribbage board in the shape of a classic Vanagon-Westfalia! We also drew the winner of our WIN AN EZY AWNING contest. Michael Egge of Alberta was the lucky guy who won a EZY Awning complete with 3 walls to make a fully enclosed room. We gave away a number of other fun prizes as well. Major thanks go to Kathy and Sheane, managers of Katherine Lake, for providing us with such great service! The campsite was spotless and it was such a luxury to enjoy a hot shower in a sparkling clean bathroom! All in all, the event was a great success! We're already excited about new activities we can add to next year's event to make it even more memorable. We hope to see you there! All our love, Trevor, the Skylight Guy and Cheri, the Skylight Gal Until next year!